I store my craft supplies in the basement when they are not in use and each time I pack them away, I try to do a quick clean out so I’ll be more excited about pulling them out again. Because when the mood strikes and I want to pull out my sewing machine, if there is any clutter there that I need to face, I’ll procrastinate on sewing. I remember procrastinating doing a project simply because I didn’t want to have to switch out the thread and reload a bobbin… Really! I need to keep everything streamlined for myself so I can enjoy it. 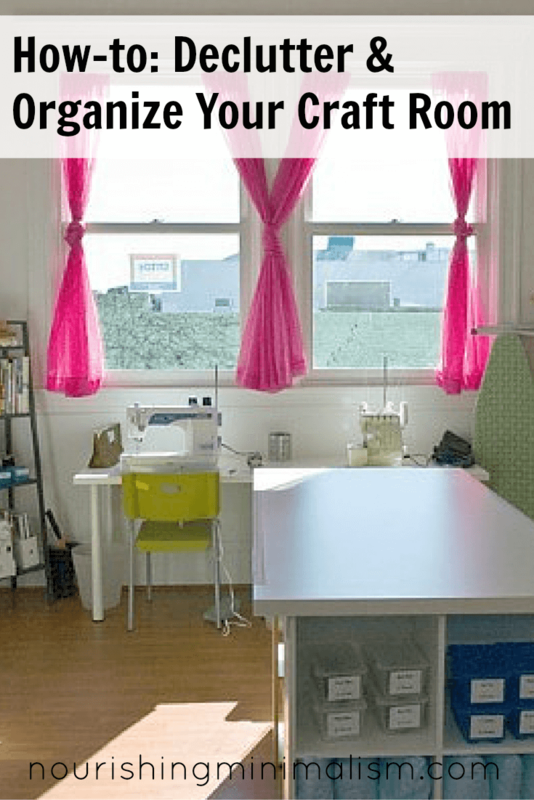 That clutter in my craft space had a lot of control over when I was creative. That’s why I embraced minimalism: so my stuff couldn’t control me anymore. Our stuff needs to serve us, not control us. I completely understand seeing the potential in all the miscellaneous supplies; the fabric straps, ribbon pieces, paper odds and ends, leftover yards of yarn… all of it. And one could use it. That doesn’t mean we will. And when we think about decluttering, the hardest part is letting go of all those possibilities. It’s important, to be honest with yourself and what you will actually do, what you actually enjoy doing and what things give you energy. Visualize the space. 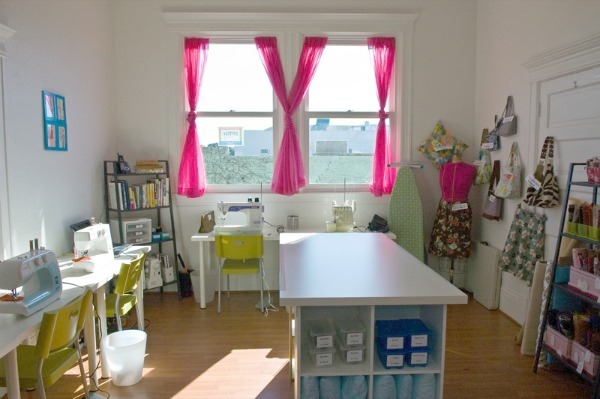 Take time to think of the uses, what you want to see, what you need, the best location for items, etc. Remove the trash. Do a quick run through, tossing broken items, scraps, etc. Sort & Declutter unfinished projects. See below. 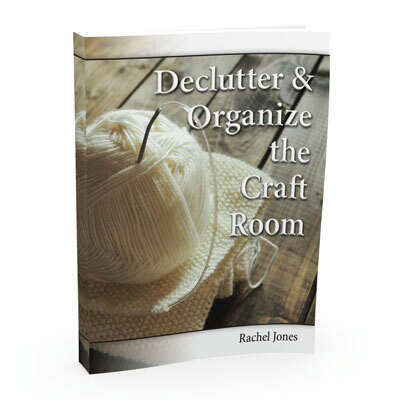 Pull out your bins, baskets, and boxes where you currently store all your craft and hobby supplies. If you have many unfinished projects, take plenty of time to sort them, one box at a time. It’s an emotional process and can be exhausting. Never spend more than 3 hours at a time decluttering, or you will get burnt out. Set a timer if you need to and give yourself a break every 30-60 minutes. Is this relevant to my current life? Do I have enough time/supplies to easily finish it this week? When I think of working on it does it still bring me joy? Unfinished projects can be a heavy burden. If you only have negative feelings as you assess the item, then it’s best to let them go. Letting go of these things will free up space to allow you space in your life now creative and otherwise. There are many people who enjoy crafting but are unable to afford supplies and would be blessed to receive those projects and complete them. There are also many who craft to bring in an extra income for their family and would be grateful for supplies they don’t have to pay for. Check your local buy/sell facebook groups, garage sale groups or young mother support groups. Mothers Of PreSchoolers does crafts on a regular basis and may be happy to take donations. Contact your local school or church to see what they take. First purge obvious duplicates, damaged items, things that never worked right for you, dated items, and things that you no longer love. Am I likely to use this up? Do I love this color/pattern/fiber/media? Is this my favorite brand? Do I have enough room to store this much? Another place I’ve found to donate craft supplies is with 4-H groups. Crafting social groups (like knitting groups) can also be a source for donations, even senior centers. I’m in a knitting social group and members are always de-stashing among each other and whatever isn’t taken among us is given to a woman that teaches knitting and crochet in 4-H. I love that you suggest donating to MOPs groups. I live in a rural town, and money is tight for many. MOPS is an affordable outlet for these moms to connect. Love the suggestions to declutter the craft room as well going by category really made a difference for me my first go round. I had to be insanely honest about crafts I no longer cared to do. It was wasteful in regards to the money spent, but it felt amazing to get a clean space!